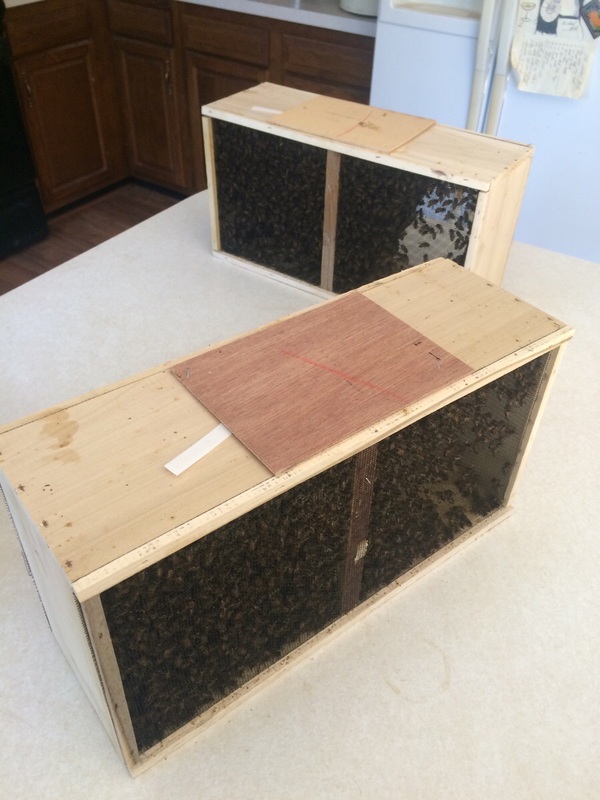 Establishing a new hive can be intimidating and stressful for a beginner beekeeper. However I can guarantee you that you will get to the end of each day performing the necesary tasks and think or say to yourself: “That’s it?”. It really is easy. Just work slowly, deliberately and patiently to ensure each task is completed. One tip I have to offer is to chose a location that puts the back of the hive is a few feet away from any obstacles. Working on the hive from the rear is much easier as the bees coming out of the entrance will not find you as easily. Assumptions for this post: you are using 10 frame supers and obtaining your colony from bee packages. Preparation will ensure that the big day is as stress-free as possible. 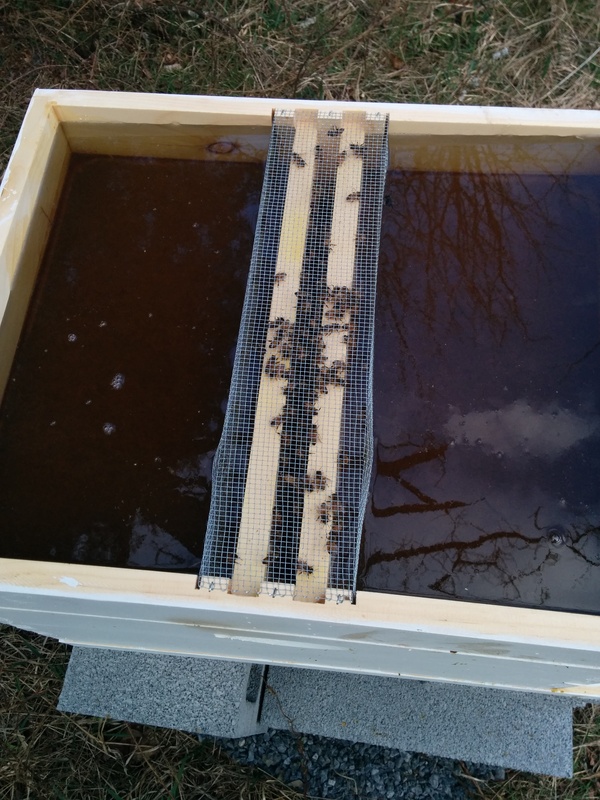 These steps include: leveling your hive site, assembling the hive and making the feeding syrup. The last on the list is important if you have a large small mammal population. Animals like skunks will disturb the hive so bees come out of the entrance where the skunk will swat them for a quick snack. Or gorge for a feast if they are undeterred literally emptying the hive. The hive stand makes it so the skunk has to expose its soft belly to reach the hive entrance giving the bees a nice target to kamakazee stingers providing the deterrent to make the skunks think twice. 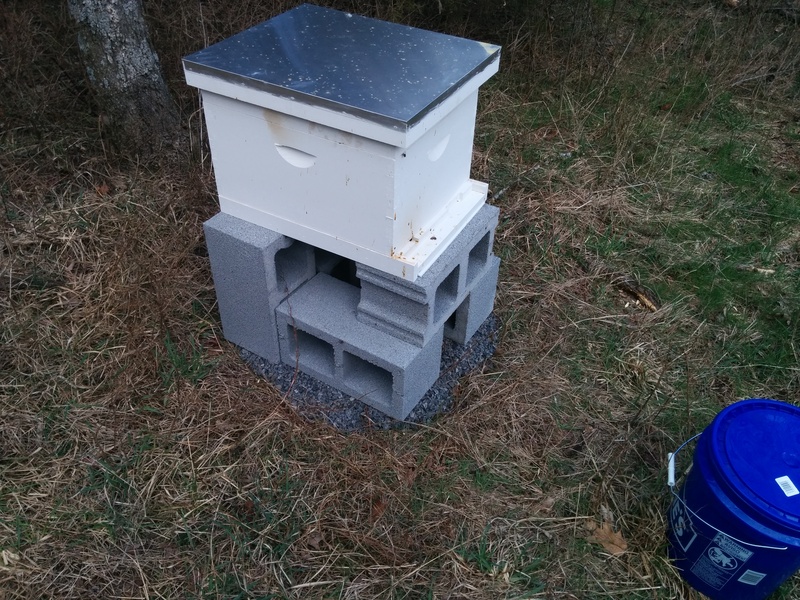 Obtain gravel, I used about 5-5 gallon buckets worth for two hives but it will depend on your topography. 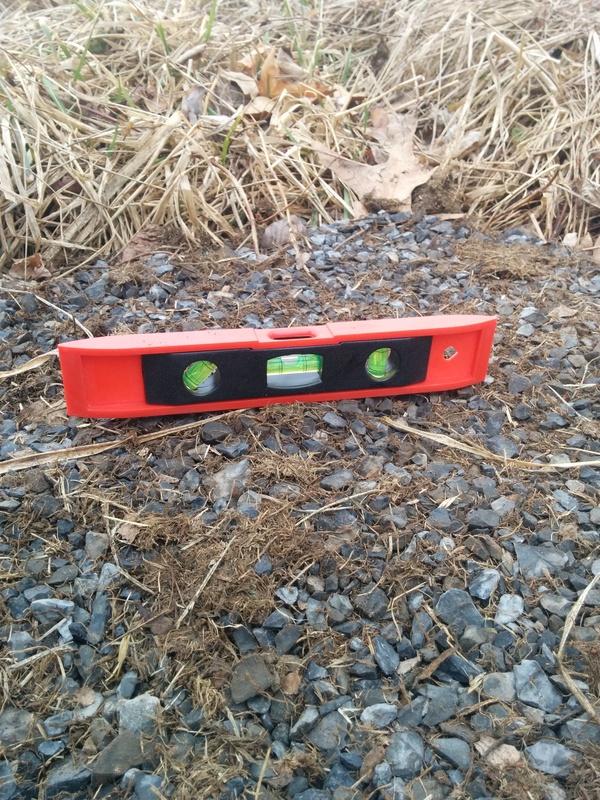 Check gravel pad with a level and add gravel where needed. 5. 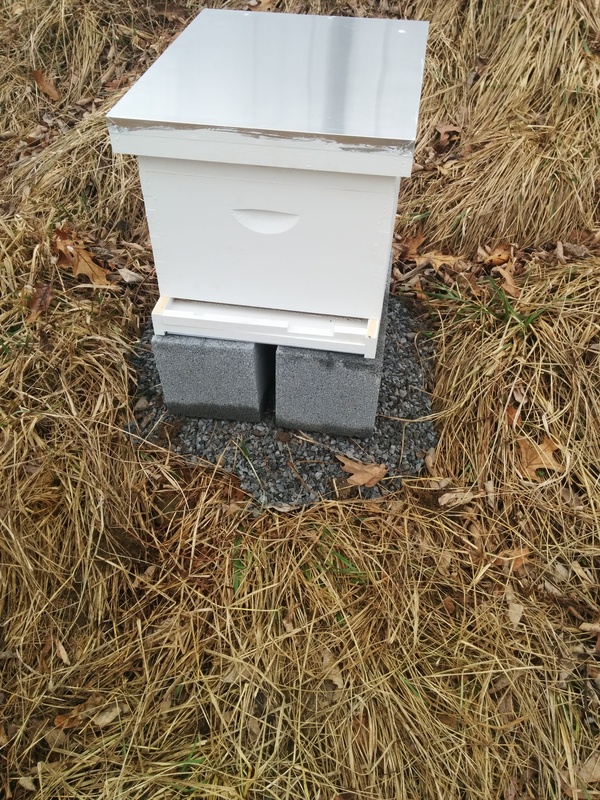 Add your hive stand. I used cinder blocks. One hive is on a slight hill so only 1 layer is needed but the other is on flat land so it required two layers. 7. Install the 6 frames. I sprayed them with 1:1 syrup fortified with Honey B Healthy. See my post here. Do not fill the feeder yet! Doing so before your colony is present will attract robber bees, wasps and other critters that will compete with your hive. Also, moving a full top feeder is awkward and asking for sticky syrup everywhere. Also make a 1:1 syrup solution in a spray bottle and fortify it with essential oils like Honey B Healthy if you wish. This will be used as a drench. When sprayed on the bees, it temporarily inhibits flying and they will become more concerned with cleaning themselves off and harvesting the sugar than most anything else. 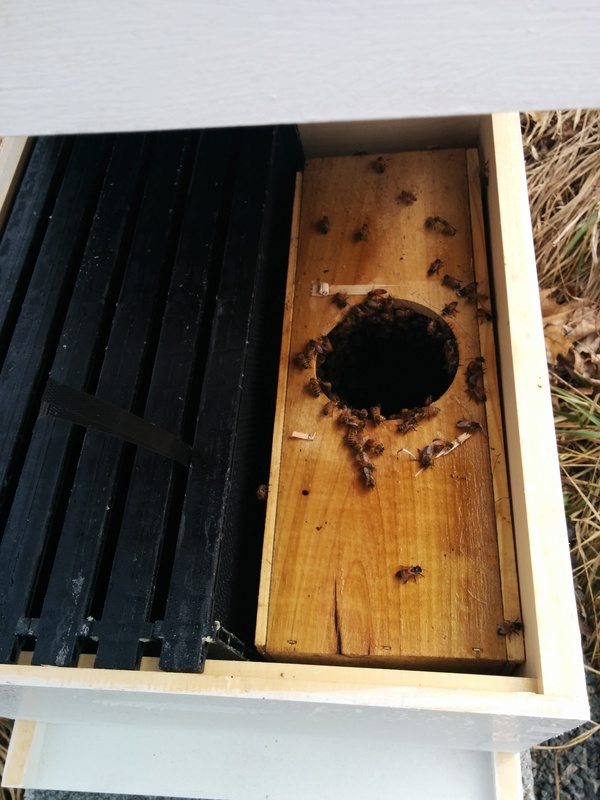 In the above package is 3 pounds of worker bees, 1 queen in a small cage (pictured below) suspended by the white ribbon, and an inverted metal can containing feeding syrup hidden under the stapled square of wood. The queen cage is a very simplistic answer to a very complicated issue. With bee packages, the 3 pounds of worker bees are not acquainted with the random, bred queen you are also provided. If immediately mixed, the bees will likely kill the queen. They need 3-5 days to typically to accept her. The queen cage is made of 3 drilled ~1 inch cells. One of the outer cells will be filled with candy. When given access, the worker bees will take about 3 days to chew through the candy freeing the queen. Coupled with transportation time, this almost always ensure enough time has passed so the queen will be accepted. Make sure four frames (or enough space for the bee package) are removed from the hive. Gear up with protective gear if you chose. Personally I like just a veil and work gloves as the bees will not be defensive until their hive is established but use whatever you are comfortable with. 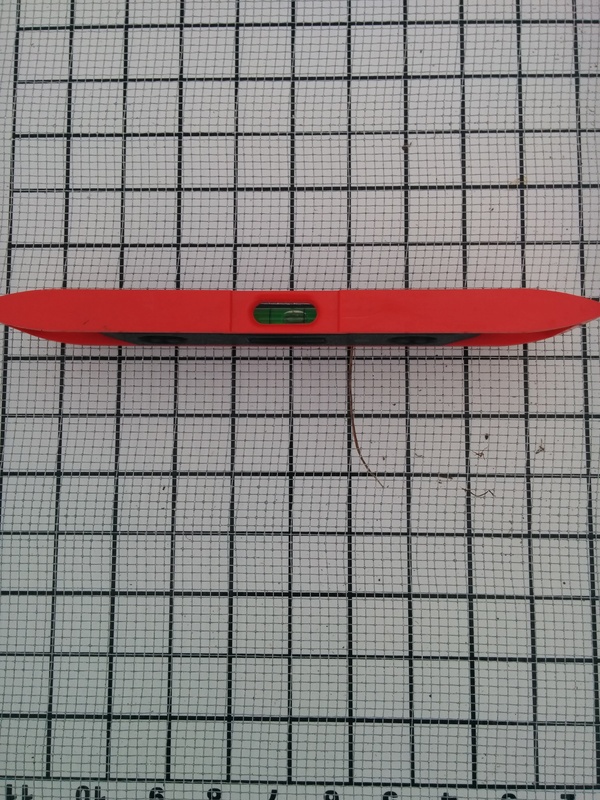 When you are ready to get to work, grab your hive tool. 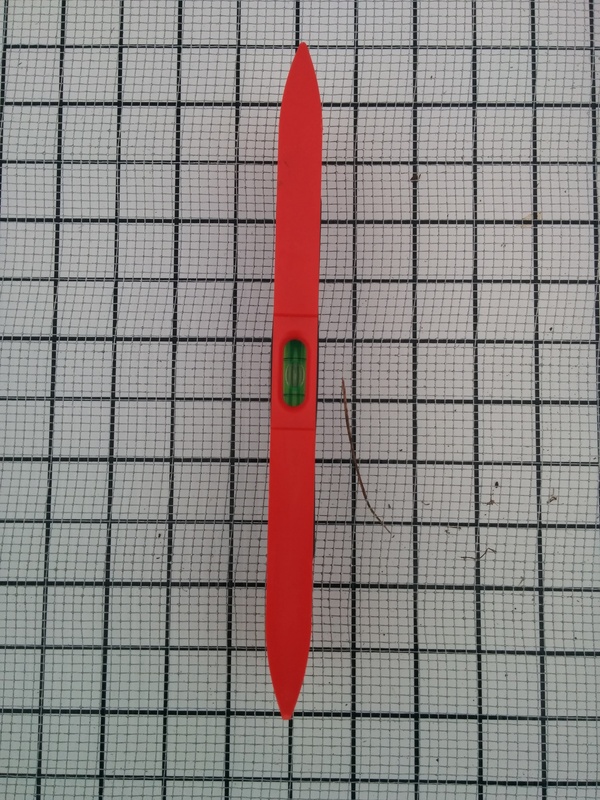 It is basically a mini pry bar, which is exactly what I use since they are $1 at the local hardware store. Liberally spray the bees with the 1:1 drench through the screen in the package rotating as you go. Shake them firmly to expose the inner bees and drench them again. Pry up the feeder can. Make sure the ribbon holding the queen cage does not fall in. Drench the hole again to discourage flying. Remove the queen cage and drench the bees clustering around it. The queen cage will have corks on either end. You need to remove the cork on the side with the candy then suspend the cage between two frames. Next, deposit the bee package in the empty cavity provided by the 4 missing frames. Below, you can see the ribbon (black metal-composite ribbon in my case) from the queen cage between the frames in the middle of the super while the package is installed in the end of the super. Just add the feeder, fill it and place the top. The first day is complete! 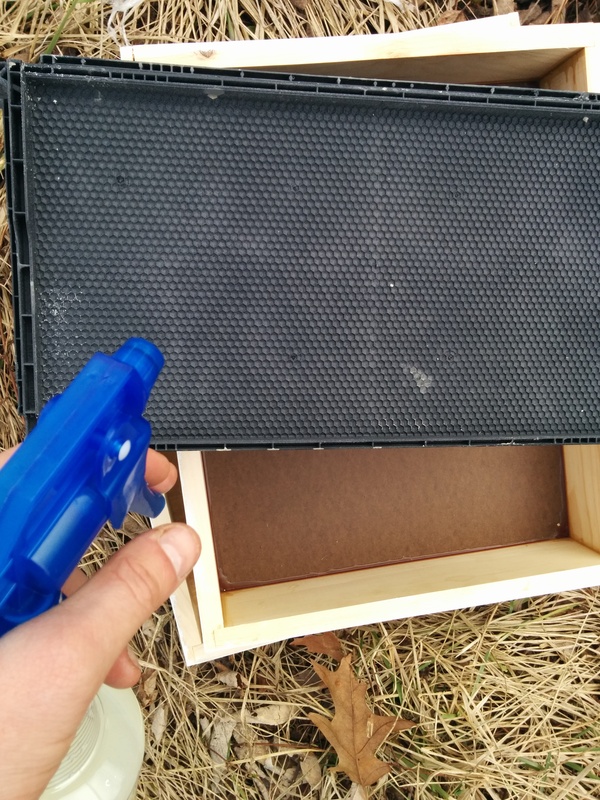 I will drizzle a tiny bit of syrup down into the hive through the feeder opening to give the bees a trail to follow. Due to being the first bit of exposure a new beekeeper has to actually handling bees, the above process is the most intimidating. But rest assured, the bees have no sense of home yet and will not be nearly as defensive as they will once they are established. On Day 2, you will need to open the hive and remove the bee package leaving it in front of the hive for another day to let and stragglers wander on into the hive while filling the voided cavity with the remaining frames. This will be the first time you will smoke the bees. I’ll post again on that process but it literally takes about 10 minutes including gearing up and getting the smoker going!